Chances are that you’re aware of the gap in wages between men and women. On average, women who work full time receive only 80% of what men working full-time receive. 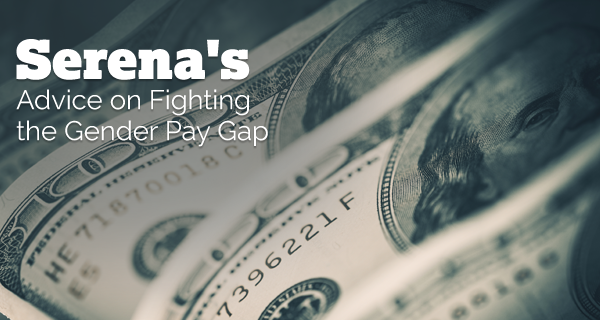 This gap only gets larger for women of color, who receive only 63% of every dollar a man makes. Even the rich and famous are not immune from this gap. For instance, in the United States Open Tennis Championship, Roger Federer received a whopping $731,000 to defend his previous title. Meanwhile, Serena Williams only received $495,000 for doing the same thing. However, Serena Williams did not take this lying down. Over a year later, she ended up writing an amazing article for Fortune to celebrate Black Women’s Equal Pay Day. In this article, she gives some excellent advice for how we can all join the fight for equal pay. Serena lays out some powerful truth in her article: we cannot solve this as a problem if people don’t understand that it’s a problem. Many people either have not heard of the pay gap or they think it’s some kind of myth. She says step one is to have conversations about how this gap is affecting women of color with our coworkers, bosses, families, and friends. The more people who know about this injustice, the more people who will be willing to stand up for what is right. One of the reasons that the pay gap affects Black women so much is discrimination. Years of systemic racism and sexism have resulted in a workplace that is much likelier to promote and reward white men than it is to acknowledge and award Black people and Black women. Serena writes about the need for Black leadership, both in the workplace and within the community. She has vowed to take her experiences into places like boardrooms so she can affect direct change within these industries. She calls on other Black women, the Black community, and allies to also take leadership roles whenever possible to change the status quo. When it comes to your boss, the truth is that you’ll rarely get what you don’t ask for. Even a completely woke manager may not know you’re unhappy with your pay until you tell him or her. Serena calls on Black women to fearlessly speak out for equal pay to their male colleagues. She sees this as having several positive effects. First, you’ll hopefully get what you’re asking for. Secondly, even if you don’t get what you ask for, simply asking for equal pay in a public way will inspire other women to do the same. Ultimately, this simple act reinforces that you’re worth much more than you’re getting paid and helps you change the world for the better. Finally, Serena reminds us that it will take a huge group effort to truly fix this broken system. It’s true that it starts by Black women raising their voices and demanding equal pay. However, it will also take legislative action, meaning that we have to contact our lawmakers and even pursue political offices ourselves. Serena Williams is absolutely right when she calls this wage gap an injustice. And the Black community is no stranger to injustice: we know exactly what it takes to fight against it. Fighting injustice is a matter of saying “no.” Say no to doing more for less; say no to staying silent about your oppression. Say no to everyone who tries to hold you back until they learn how to say yes to equality. In this way, we can all be like Serena and try to make the world a better place. Serena is absolutely amazing and right. Times up, for women of color to get what we so deserve. Racism now is more prevalent then ever. We have a difficult struggle ahead. But we have come this far by faith. I appreciate these articles, perhaps a topic surrounding the high school graduation rate in povern communities will open peoples eyes to differences in opportunities and highlight where we need to focus in our communities so we have more qualified blacks capable of filling the above mentioned leadership positions. As the owner of a small business, I am interested in knowing more about One United Bank. I did not know that One United Bank existed. I definitely need to do my research and get set up.